For many people, the contemporary history of the Chicago-style slam begins around 1987, when the Green Mill began to come into emminence as a regular poetry venue in Chicago. Others clock their experience from the Poem for Osaka competition. The history of slam poetry (as a style) is wound tightly with the history of the poetry slam (as a social enterprise, a contest). The phenomena often have different connotations from one group of writers to the next, and the origins of these connotations lay in the history of slamming. The history comes from many voices, across an ever growing number of years. Marc Smith precipitated a phenomenon which, while not new, had been overlooked and undervalued. In 1985 renewed forces were converging which met once only a few years before. By 1985, he was hosting readings at the Get Me High Lounge, contemplating the formation of the Chicago Poetry Ensemble and working with his friend Ron Gillette who wrote poetry for performance in character. But the Get Me High venue of 1985 was connected to other poetry readings held earlier still. There had been readings held in otherwise non-literary venues in Chicago by the late 1970s and early 1980s. Jerome Salla and Elaine Equi were part of that scene. Says Equi, "Jerome and I got together in 1978, maybe '79, for readings at Facets Multimedia." According to Equi, the scene was building up. "What was interesting was that Jerome was getting bigger audiences, drawing from bars, the Art Institute scene, from [clubs such as] O'Banyon's, La Mere, artists, and publishers. The people around the Body Politic [theater] were one scene. But when Jerome and I would read, it was not really a literary crowd." According to Bob Holman, Ted Berrigan and Anne Waldman did a poetry bout dressed in boxing gear, around 1979, but Holman didn't first communicate with Marc Smith until after he visited the Green Mill in person. Salla constructed his own poetry competition based on a boxing match by 1980, and it was rowdy. Elaine Equi said, "My husband [Jerome] was reading at somespace in Chicago... his readings were always accompanied by a lot of audience participation. There was one particular musician, named Jimmy Desmond, who got irritated easily when he was drunk. He grabbed a chair and swung at Jerome. There was a fight, but it didn't actually come to blows." "Simmons might have got the idea from professional wrestling, and told me at one point he saw a couple poets in a boxing ring in New York... And wanted a match between me and Desmond. We staged the first one at a fly-by-night club in 1980. I read a poem called 'Give Piss a Chance' shortly after the death of John Lennon, and the crowd booed!" Equi explained further, "They had a stage like a boxing ring... Girls in bikinis, holding up cards for the number of the rounds... And judges... each round Jerome and Jimmy reading one poem. Jerome won." It was not a fluke, Equi considers. "They had a rematch and he won again." About two hundred people witnessed the second match. "The rematch was at Tut's on Belmont [at Sheffield, now The Avalon]. I read in leather boxing shorts, had a robe that said Baby Jerome. Jimmy had a nickname too. We didn'treally hate each other. It was just a funny, kind of weird event we threw to make money," says Salla. "There was a little story in the Trib." "We were with the punk scene. A lot of forces were converging in Chicago at the same time," Equi remarks. "Suddenly therewas an audience for poetry. There really isn't anything that close to the experience today except in rap music." Salla adds, "We did just these two events. So then Al tookit out to Taos, then he called me six months later and said,'Hey, do you want to do this boxing thing in the ring? We've got [Gregory] Corso.' I didn't wanna do it. There was just more negative energy from it. I was really crashing and burning then. Terry Jacobus went out [instead] and won." Recognition for this new breed of urban, punk poetry was hard to get. The Chicago matches were outside the domain of the gallery system and the academy, so they were much more the exception than the rule. And because they were held in more of a social climate than an institutional one, artistic recognition wans spare. Equi's and Salla's own readings, as well as the poetry matches, were extracted from the punk movment and, Salla pointed, "It was the end of the punk age. Everybody was throwing stuff, swearing, insulting, and loud. It was a more verbally confrontational time, not just with us on stage but also with the audience, back and forth with the poet... Just that constant thing where you'd assault people verbally... " The last thing in anyone's mind at the time was the consequence of their actions." There was also the issue of what other contemporary writers were trying to achieve in their writing. Since most young, schooled, and aspiring writers were working to advance the continuity of their art, their creative dialectic concerned itself first with the art of written poetry. 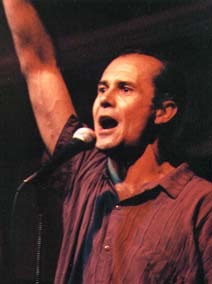 In the early 1980s, Marc Smith was a young and informally trained writer and performer. He took up no such dialectical connection and had little personal baggage. Smith had nothing to risk by adopting a stance of his own. He spoke of his mission, "I wanted to maintain the idea of theresponsibility the poet had to communicate effectively." He sought to balance poetry versus performance in a practical way. "The real source of what made it more effective than what was going on in the academy was that the poet knew he had to keep their [the audience's] attention or he was going to get booed out of there." Smith wanted the people in the audience to judge by making them part of an overt dialectic from poet to public, not just from poet to poet. In reaction, the so-called academic poets put themselves in a different camp; Smith and the academics were not to begin reconciling for almost a decade. But Salla suggested that the scene outside the academy was burning everybody out, "I'll tell you one thing that was strange about it... After the second one there was a guy who came out of the audience who said, 'You think you're a real tough guy!' He treated it like a real boxing match and wasgoing to get in the ring and fight! Everybody was prettywasted... audience, performers, and so on... It's kind ofdifficult to remember what I got out of it! I don't evenremember any of the plans for it. It seemed kind of anti-art,so we said, 'Yeah, let's do that.' "
Still, there were rewards, as Salla reckoned, "I think one thing about that time is that it proved that you could really get poetry to a semi-popular state, because there were a lot of people who showed up and wouldn't necessarily read it for themselves. It was an event and it really took poetry out of the ivory tower, more so than it had been before. Those events were resonant in a lot of people." After the poetry bout at Tut's, Salla and Simmons' fight concept wandered within Chicago. Elaine Equi explained,"Jerome's best friend was named Butchie. He was the fellowwho grabbed the chair and kept Jimmy Desmond from hitting Jerome. After we did [the poetry bout], Butch did it at the Get Me High Lounge. We had no real plan. We did it spontaneously." But Salla vaguely contradicts Equi. He says,"I don't really know if anyone kept the poetry match going after we did." Salla confirms that the years 1981-84 were relatively quiet for performance poetry in Chicago. However, he does say, "I sort of dropped out of the scene... The guys from the [Green] Mill used to hang out at this bar [the Get Me High Lounge]... Butch claims they got the idea because he mentioned it to them..." Much later, Marc Smith colleague Rob VanTuyle noted more clearly, "Marc always said that this was never his original idea. But as far as I know he modified it." Whatever the case, the ambience of the Get Me High attracted Smith to Butchie, so that by 1985 Smith was hosting his own readings there on a regular basis. As an actual venue, The Get Me High Lounge was a small, damp,run-down bar set in the very center of Chicago's Bucktown neighborhood. The walls were narrow, painted black and graffiti'd upon as though they were a chalkboard. Newsclippings, album covers, and old jazz posters smothered what was left of the walls. In winter, gray street slush covered the floor while the guests' heads sweltered. The ceiling leaked a smelly, nondescript liquid onto the bar at a corner near the door; and guests suspected it was the toilet upstairs. The club's own rest rooms were actually on stage at the back of a small area, three steps up from the street-level floor. The club survived on late nightjazz performances most of the week under Butchie'sproprietorship. Butchie spoke only a minimal, rapidlymuttered English to his new guests, if he spoke much at all,though he did heckle the poets. The clientele often feltthey'd arrived in another anxious, dangerous but enticingworld. It has been said that Studs Terkel and, after he leftthe presidency, Jimmy Carter visited the Get Me High to hearjazz. Monday nights were reserved for poetry with Smith at thehelm. Attendees came from most of Chicago's poetry scene,and occasionally from afar. Michele Fitzsimmons, Joe Roarty,and Debbie Pintonelli were featured poets. On one night inJanuary 1986, a woman read a poem in the open mike expressingenvy from not being chosen as the grade school teacher to bea space shuttle astronaut; the next week Krista McAuliffedied in the Challenger explosion. Among the regulars, therewas the immediate acknowlegement of karma. When an older gentleman named John Scroggins, himself a regular listener and a business associate of Smith's wife Sandi, died in a carcrash, Smith broke the news to the house that the emergency crew found a walkman playing back Get Me High readings by Scroggins' side. The house was never the same thereafter. The people, poets and audience alike, felt they were riding toward the edge of some strange destiny, but no one could articulate what it was going to be. With the scent of riskin the air, the Get Me High people took their poetry more seriously and so began an informal one-up-manship among themselves. This spirit was a long time in coming according to Marc Smith. "We didn't see many people come in the first year at the Get Me High. There was Monday night football and other obstacles to getting an audience." Also, once the audience established itself, the venue needed a way to maintain communication. Marc and Sandi Smith published a newsletter, Open Mike, for several seasons as a chronicle to the events around their scene. This early four-page 'zine listed poets' upcoming appearances in and around Chicago and had short reviews. 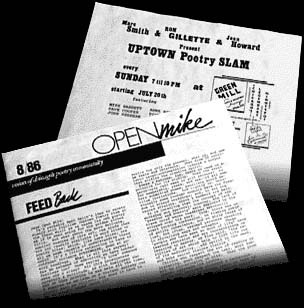 By 1987, Open Mike became part of the other xerox-printed poetry flyer in Chicago at the time, Letter eX, thanks to Debbie Pintonelli and to Karen Nystrom, a regular Get Me High poet who became managing editor at Letter eX. Elaine Equi recognized Smith's contribution. "Marc worked harder than we did for the slam. He saw it as a promotable phenomenon." According to Smith, "We all learned a lot from trial and error. It was the job of the poet to try to communicate, and we fostered that at the Get Me High. We wanted to emphasizeartistic responsibility. We started [the slam style] with contributions of democratic origin, a focus on the community and the audience, the poet as the servant of the people." As poets gathered at the Get Me High, Smith had a chance to survey new talents and create new events. He opted to create group readings outside his usual efforts at the Get Me High. First, he put together a reading with Julie Parsons, Carl Watson and Alice George at the Deja Vu Lounge (circa 1985).Then he assembled the Chicago Poetry Ensemble to perform a group reading called "Circus Chatter", also at the Deja Vu (May 1986 ). "When I went out, I kind of hand-picked those people", says Smith. "I wanted to have an ensemble, a group of poets who would perform. I looked for people who had a flair for performance. The step with the Chicago Poetry Ensemble [was to find] poets who would start learning about performance. That was the new direction." Butchie's business practices were, at the time, dubious bywide repute. Before very long, he sold the Get Me High to Dave Jemilo, proprietor of the Green Mill and the Deja Vu. Marc Smith set his sights on setting up a new venue. Jemilo was encouraging. Rob VanTuyle explains, "Our official audition for Dave Jemilo was Circus Chatter. I remember Dave sitting at the bar at the Deja Vu saying, 'I don't mind thinking once in awhile.' That was May 1986. Our first date [at the Green Mill] was on July 20th. It was billed as a presentation by Marc Smith, Ron Gillette and Jean Howard." Jemilo offered Smith the Green Mill as a permanent venue. The Sunday night events at the Mill, which commenced on 20 July 1986, were strong and, like Salla's poetry bouts, very much outside the established literary community. Despite this fresh start, there still were a few practical shortcomings. Marc Smith was given an entire evening to work with, so he divided it into three sets, each set under an hour spaced by intermissions for the bar. This meant filling each set with something different, an easy task for theater or music but much harder to do with poetry. Featured poets occupied the second set of an evening and drew new audiences to the Mill, while an open mike filled the first set. The third set was the responsibility of the Chicago Poetry Ensemble. As such, the Ensemble was inadvertantly put into a dilemma of writing poetry under rapid deadlines, and having potentially rapid reruns of existing material played before audiences built from regular attendees. It was clear that something else was needed to fill the third set. Van Tuyle says, "In the beginning there was no competition. When we [the Chicago Poetry Ensemble] started, I was in it for the performance. I was into music, not into competition. After the third week Marc came up with 'slamming'. It was poetry against the convention, in bars instead of salons." Smith decided that a competition would be key to entertaining a returning audience. The contest was polemically dubbed"The Uptown Poetry Slam." The first slams were run as exhibition bouts and, while not formalized as they are today, were like present day slams in every regard. Anna Brown recalls, "All I remember is we performed the first one in Gurnee, then for real at the Mill. It was Marc's idea. I had this character called Rambolina. Jean Howard had her own." Van Tuyle adds, "She was a ballerina in camouflagewith weapons and Jean showed up in leather shoulder pads and studded leather gloves with spikes." Brown goes on, "Marc wanted us to do battle. We [Jean Howard and I] worked together on it. We came up with poems we could battle with." Judges, who were picked from the audience, held up score cards immediately following a given poet's reading to pass sentence (or praise) with a score from one to ten. When the scores added up, "I won!" exclaimed Brown. "I beat her. I don't know why because my poetry wasn't as good as hers was. But I appealed to the crowd." "Nobody knew what a slam was at this point, so we were helping to define the process," said Jean Howard. "The whole idea was to help the public understand what a slam was. We went into it to be very obvious, but also let people know that there was a lot more to it than just a contest, that we could be quiet, subtle, or dramatic, whatever..."
In time, poets-at-large filtered in to join the competition in earnest. Mary Shen Barnidge was one of the first. Inka Alasade (then known as Teri Davis) held an early dynasty as champion, successfully defending the title from Tony Fitzpatrick over several attempts. 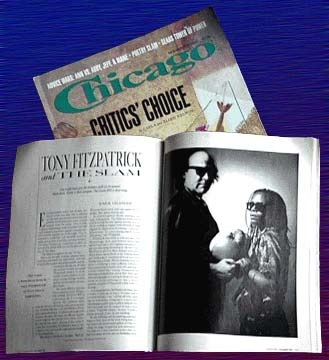 By November 1987, Chicago magazine had chronicled the Davis/Fitzpatrick rivalry, and slamming had become a big-time affair in the Windy City. The slam's success with the public, its ability to engage a general audience, set it apart. At the Green Mill, all the appropriate ingredients at last came together to make the venue a success: concept, contributing artists, host personality, audience, and aesthetic. Meanwhile, others were connecting nationwide. Bob Holman almost chanced upon the Green Mill. He followed a lead, "It must have been in an early article in the New York Times. I was in Chicago visiting relatives and thought I might be able to drop by and visit the phenomenon, this gladiator concept. Van Tuyle was in his tux, Marc was in an auto accident." Looking back to that time and Smith's recovery, Holman considered, "It was in that moment when Marc rededicated himself to poetry. "I had been traveling around the country doing performances and at that time had just began to realize the extent and variety of poetry," he continued, "I came to Chicago and was blown away by the crowd, the whole openness, the entertainment of the crowd... It was an immediate appropriation. It reminded me of when I first heard rap at the Nuyorican [Poets' Café]. Here they were living a dream, dancing to poetry. I knew the slam was a hoot, was going to overhaul the engine of the nation, and that I could do this..."
Continue to the next section: Diaspora.